Graduation photographs allow you to capture the momentous day forever. This is not the day to be trying out experimental photography techniques; instead, stick to classic settings and poses for the best results. The best time to take graduation pictures is before the ceremony. This way, parents, grandparents and the graduates have not started crying, hair has not been mussed, and the cap and gown are still intact. Take both individual and family portraits before heading off to the ceremony site. Before snapping photographs, whether indoors or outdoors, check to make sure the lighting is adjusted so the graduation cap does not cast a shadow on your student's face. If it does, change your location or tip the cap up slightly for photographs. Have the senior pose in his cap and gown. If the weather is nice, look for a pretty place to take pictures outside. Near a barn, on a swing, by a tree or in front of a garden are all great places to shoot photos. Inside, take a few full length and head-and-shoulder shots in front of a plain background, like an empty wall. Incorporate photography props, such as a decorated graduation cake or high school awards into some photographs as well. Upon arrival at the high school, take a moment to shoot a picture or two next to the school's signage, football field, or another important area from your child's school years. Posing in front of school lockers is also fitting for a graduation picture. Take a group family shot before leaving for the ceremony. Take your own family photo with help from a tripod. Set it up with a self-timer so you have time to join the photograph. Do at least two shots of each pose. Consider snapping a few staged photos, such as a father shaking his son's hand or mother hugging her daughter. If you do not have a tripod, ask a family friend or close relative to take a few photographs for you. Sit as close to the stage as possible. Use your zoom lens and flash. Take a few shots of the processional and recessional. Let your child know where you are sitting before the ceremony begins so he can be looking on your direction. Change your camera aperture settings instead of shooting in "auto" mode. 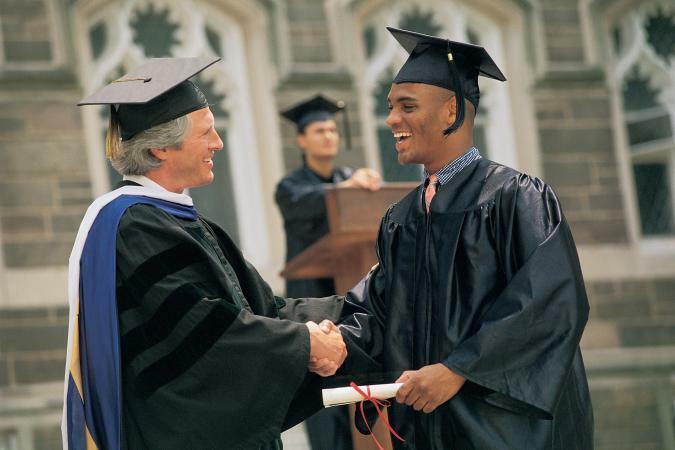 When it comes time for your child to cross the stage and accept his diploma, you need to be ready. As your student moves to the front of the line, make your way down the center aisle. Then, change your camera settings to take more rapid photographs. This way, you do not miss a moment. The closer you are to your subject, the better your chances of getting a decent shot. 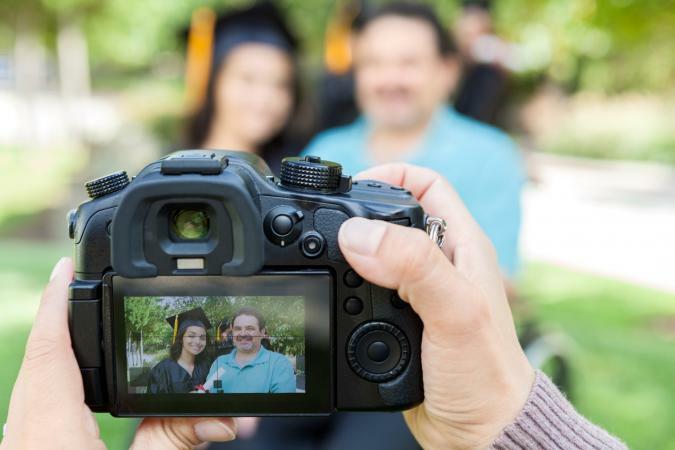 Move quickly and quietly out of the way after your child has crossed the stage so other parents and relatives can take photographs of their graduate, too. Once the graduation ceremony is over, you will likely have a reception. Before your senior takes off his cap and gown, get a few photographs of him with his diploma. Remember to snap a few shots of the family and the diploma too. At the reception, you may want to hand your camera off to a few trusted friends or relatives to attend to some of the party details. However, periodically check in with your friends and take a few photos yourself. Read up on beginner's photojournalism to get the best candid shots. It may help to write down certain poses or people you want to get photographs of your child with before the reception ends. Grandparents, best friends, siblings, and long-distance relatives usually top the list. If you did not get a photograph of the cake, decorations or other party elements before the graduation ceremony, now is the time to do so. Many of these hints are similar to photo portrait or how to take good pictures in general. Remember to have extra camera batteries on hand and to clear your memory card before the big day arrives so you do not miss any special moments.